Governments, business and residents in New Orleans and the central Gulf coast rushed Tuesday to complete last-minute preparations to bear the brunt of Hurricane Isaac. The storm made initial landfall Tuesday evening as a Category 1 hurricane after graduating from tropical storm status Tuesday afternoon. Read the full CNN.com story here. [Updated 11:11 p.m. ET] Hurricane Isaac is "producing a dangerous storm surge" along the northern Gulf Coast, the National Hurricane Center said in its 11 p.m. ET update. Flooding from heavy rainfall will follow the storm surge, the NHC said. At 11 p.m. ET, the storm's center of circulation was about 75 southeast of Houma, Louisiana, or 75 miles south-southeast of New Orleans, still moving at 8 mph with 80 mph maximum sustained winds. [Updated 11:01 p.m. ET] Designer John Nelson created this fascinating and oddly beautiful visualization of every hurricane recorded since 1851. It's reproduced by Fast Company. The image takes some getting used to, as it employs a southern polar projection; that is, Antarctica is in the center of the picture, with the other continents extending away from it. Hovering your mouse over the map enlarges an area so you can see greater detail. Nelson created the map using data from NASA Visible Earth and NOAA International Best Track Archive, according to Fast Company. [Updated 10:45 p.m. ET] Tropical Depression 11 rapidly intensified Tuesday evening and became the 11th named storm of the 2012 Atlantic hurricane season, Tropical Storm Kirk, the National Hurricane Center said. Kirk is located in the middle Atlantic and is not likely to become a threat to land. [Updated 10:40 p.m. ET] Utility companies in four states report more than 200,000 customers have lost power because of Hurricane Isaac, all but 1,000 of them in Louisiana. NAIROBI, Kenya (CNN) - Protesters threw a grenade at a vehicle carrying anti-riot police in Mombasa Tuesday, killing one officer and wounding 13 others, a police official said. The violence came on the second day of protests after a radical Muslim cleric was killed in the same city Monday by assailants his wife claims were police. Provincial police chief Aggrey Adoli told CNN the police were on their way to help beef up security because of the ongoing riots. An unknown perpetrator hurled a grenade at the police truck, causing the fatality and injuries. The wounded are being treated at two hospitals in Mombasa, Adoli added. 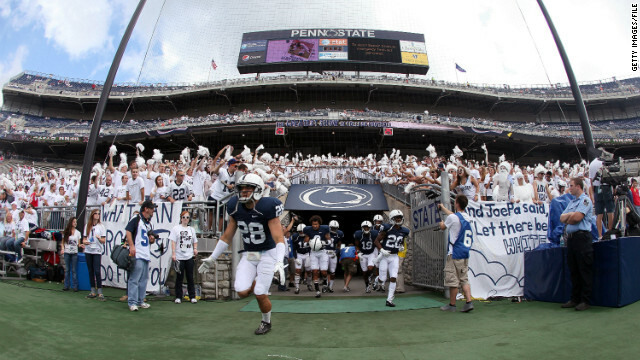 The Penn State football team takes the field against Alabama on September 10, 2011. Penn State football fans will no longer be singing "Sweet Caroline" while cheering on their Nittany Lions, according to university officials. Neil Diamond's classic song, often sung at sporting events and particularly at Boston Red Sox baseball games, has been rotated out of the playlist for Beaver Stadium this year. Chatter quickly began building on the State College campus and on social media platforms after the Altoona Mirror newspaper reported that officials were concerned about the lyrics to the song, in the wake of the Jerry Sandusky scandal. Sandusky, a former assistant football coach at the university, was convicted in June of sexually abusing 10 boys over 15 years. He continues to maintain his innocence. The song, said to be written about Caroline Kennedy, contains the lyrics: "Hands, touching hands, reaching out, touching me, touching you." But those words, and the scandal, have nothing to do with removing the song from the game day playlist, Penn State spokesman David La Torre told CNN. "Absolutely no song changes were made based on lyrics. This song has come up on the list in recent years because it happens to be played in so many other professional and collegiate venues and has no real origination here at Penn State," he said. "So while wholesale changes to what happens on game day are not in store, some 'updating' is going to occur, including the music playlist." La Torre said the updating happened to include "Sweet Caroline" and noted that these changes happen "each year for both recorded music and the Blue Band," which plays at the games. The Altoona Mirror has recently updated its story to reflect that the choice was not made because of song lyrics. While the playlist update may not be a result of the scandal, there has been one change that grew out of the Sandusky incident. The numerous athletic facilities around Penn State will no longer be available to the public, a decision that Penn State spokeswoman Lisa Powers tells CNN was made as a result of several factors. A police dashcam video shows a dark SUV flying past cars and blowing through construction. The driver's 911 call tells the rest of the story: Lauri Ulvestad, utterly terrified, frantically steering a 2011 Kia Sorrento with a jammed accelerator taking it to speeds up to 120 mph. Ulvestad credits dispatcher Kelly Brieg with keeping her calm and ultimately saving her life. A man trying to create a Bigfoot hoax on a highway died after being hit by two cars, officials in Montana said. Randy Lee Tenley dressed in a Ghillie suit - camouflage designed to resemble the ground and trees - and stepped out onto Highway 93 Sunday night, officials said. "He probably would not have been very easy to see at all," said Jim Schneider, a state trooper. A 15-year-old girl hit him with her car, another car swerved, and a third car driven by a 17-year-old ran him over, CNN affiliate KECI reported. Tropical Storm Isaac could make landfall in the U.S. Gulf Coast as soon as tonight. Watch CNN.com Live for continuing coverage of the storm. 8:30 am ET - Casey Anthony defamation hearing - Attorneys for the woman suing Casey Anthony for defamation will ask a Florida judge to force Anthony to reveal her finances and source of income. Nine years after an American activist was crushed to death by an Israeli army bulldozer, an Israeli civil court ruled Tuesday that Rachel Corrie's death was an accident. On Tuesday, a judge in Haifa said the family has no rights to damages. Corrie, an American peace activist and human rights defender, was nonviolently protesting the demolition of Palestinian civilian homes in Rafah, Gaza, when she was fatally struck. She was working with the Palestinian-led International Solidarity Movement when she died. The Israeli Ministry of Defense said in 2010 that it regrets Corrie's death. "But she was in a known combat area, so the (Israeli Defense Forces) does not have responsibility," a spokesman told CNN. "The case is with the court, and they will make their decision." A Chicago hotel has closed and drained its pool, hot tub and fountain in response to the deaths of two people who contracted the flu-like Legionnaires' disease, authorities said Monday. Since August 14, health officials have recorded eight confirmed cases of Legionnaires' disease, including the two deaths, among guests who visited the JW Marriott Chicago hotel in downtown Chicago. "We believe that there is no ongoing health threat at the hotel. Individuals who stayed at the hotel during this time period who are experiencing flu-like symptoms are encouraged to get in touch with a healthcare provider because it is important that all potential cases are diagnosed and treated as soon as possible," said Kathleen Ritger, a doctor at the Chicago Department of Public Health. Legionnaires' disease is a respiratory bacterial infection usually spread through mist that comes from a water source, such as cooling towers, air conditioning or showers. It is not transmitted person to person. Symptoms of the disease include fever, chills and a cough. The voice of NASA's chief has boldly gone where no voice has gone before - to another planet and back. Words uttered by Charles Bolden, the administrator of NASA, were radioed to the Curiosity Rover on the surface of Mars, which in turn sent them back to NASA's Deep Space Network on Earth, NASA said in a statement Monday. The successful transmission means Bolden's space-faring comments are the first instance of a recorded human voice traveling from Earth to another planet and back again, according to NASA. In the recording, Bolden congratulated NASA employees and other agencies involved in the Curiosity mission, noting that "landing a rover on Mars is not easy." "Others have tried," he said. "Only America has succeeded." The announcement by NASA of the voice transmission, the latest in a series of advances by Curiosity since it landed on Mars earlier this month, comes just days after the death of Neil Armstrong, the first man to walk on the moon. "I don't know how it got to the point where two people got murdered," Burnett said in court. Burnett talked about how he and three others accused - Pvt. Isaac Aguigui, Sgt. Anthony Peden and Pvt. Christopher Salmon - had first begun getting together "just going out shooting guns, just guy stuff." "And then Aguigui introduced me to 'the manuscript,' that's what he called it, a book about true patriots," the soldier said. The four men became part of a group that aimed "to give the government back to the people," according to Burnett, who admitted that revolution was its goal. They called it FEAR - Forever Enduring Always Ready, and spent thousands buying guns and bomb parts. 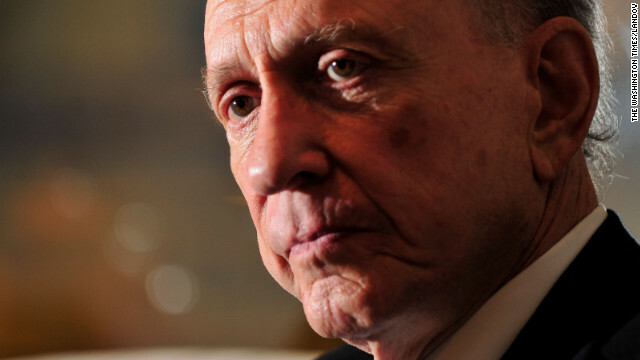 The government needed a change, Burnett told the court. "I thought we were the people who would be able to change it." Assistant District Attorney Isabel Pauley said it was "unknown" how many others belonged to the group. She identified Aguigui as the leader of what she described as "an anarchist group and militia" that included active and former troops. "Defendant Aguigui actively recruited new members at Fort Stewart and targeted soldiers who were in trouble or disillusioned," she said. At the time of their arrest, group members had plotted a number of "acts of domestic terror," the prosecutor said. Filed under: Crime • Justice • Terrorism • U.S. The Colombian president said Monday the government is in "exploratory" talks with Latin America's oldest insurgency. The FARC was formed in 1964. Espousing anti-U.S. and Marxist ideology, the group draws the overwhelming majority of its members from the rural poor. Its aim is to overthrow the government. Though it began as an insurgency and continues to champion leftist causes, the FARC is sometimes criticized for eschewing its beliefs in favor of running drugs. Colombia is one of the world's top cocaine producers and the FARC is estimated to make around $500 million from the illicit trade per year, according to the Council on Foreign Relations. Peace talks between the rebels and the government have occurred sporadically since the 1980s. A cease-fire brokered in 1984 included the release of a number of imprisoned guerrilla fighters. That truce ended in 1990 when several thousand former FARC members were killed. The last attempt at peace fell apart in 2002. Then-President Andres Pastrana ceded control of an area roughly the size of Switzerland to the FARC, but broke off talks after a series of high profile rebel attacks. The government moved to retake control of the so-called neutral zone, and the sides have been at war since. From its peak, the FARC has shrunk considerably in both size and strength, in part because of a U.S.-backed security campaign. As of last year, the group was thought to have around 8,000 troops, down from more than 16,000 a decade earlier. The FARC has also lost several of its top leaders. In November, the group's head, Alfonso Cano, was killed in what President Juan Manuel Santos described then as the nation's "most overwhelming blow" against the rebel organization. Colombian security forces killed the then-second-in-command, Raul Reyes, during a 2008 cross-border raid into Ecuador. That same year, FARC founder Manuel Marulanda died of an apparent heart attack. Rebels and government troops still clash with regularity and the FARC is capable of inflicting serious casualties. Between 2010-2011, attacks rose by 10%, according to the Colombian think tank Nuevo Arco Iris. Some saw the increase as evidence of a comeback, while others argued it reflected a desperate attempt by the FARC to hold strategic land. The rebels remain in control of some remote regions, notably in the southern jungle. In its struggle against the government, the FARC has engaged in bombings, murder, extortion and kidnappings. Among the highest profile cases in recent years was that of Ingrid Betancourt, who was kidnapped in 2002 during her campaign for the presidency. She was freed in a helicopter rescue mission in 2008. Colombian commandos posed as humanitarian aid workers to liberate the group, which included three U.S. military contractors and 11 Colombian police and military members. After Cano's death, the FARC tapped a new leader, Rodrigo Londono Echeverri, who is also known as Timoleon Jimenez or Timochenko. The U.S. State Department alleges he has run the FARC's cocaine operations and ordered rebels to "shoot down fumigation aircrafts, increase coca production, kidnap United States citizens and kill farmers who sold cocaine paste to non-FARC buyers." A $5 million reward is offered for information leading to his arrest.